In this article, you'll learn to pass an array to a function in C++. You'll learn to pass both one-dimensional and multi-dimensional arrays. C++ Program to display marks of 5 students by passing one-dimensional array to a function. When an array is passed as an argument to a function, only the name of an array is used as argument. Also notice the difference while passing array as an argument rather than a variable. The argument marks in the above code represents the memory address of first element of array marks. And the formal argument int m in function declaration converts to int* m;. This pointer points to the same address pointed by the array marks. That's the reason, although the function is manipulated in the user-defined function with different array name m, the original array marks is manipulated. C++ handles passing an array to a function in this way to save memory and time. C++ Program to display the elements of two dimensional array by passing it to a function. 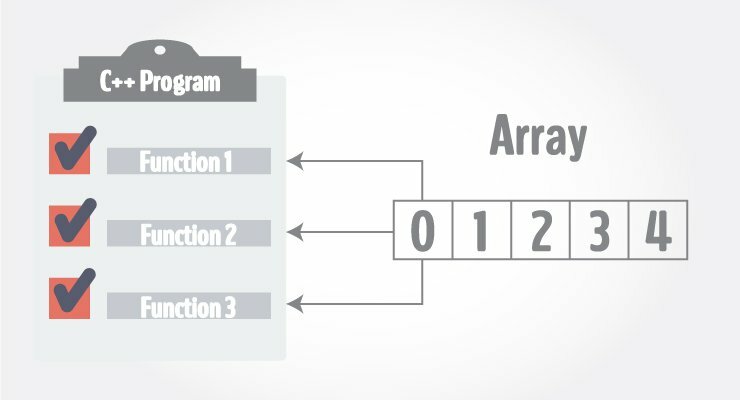 In the above program, the multi-dimensional array num is passed to the function display(). Inside, display() function, the array n (num) is traversed using a nested for loop. The program uses 2 for loops to iterate over the elements inside a 2-dimensional array. If it were a 3-dimensional array, you should use 3 for loops. Finally, all elements are printed onto the screen. Note: Multidimensional array with dimension more than 2 can be passed in similar way as two dimensional array.